I certainly carry certain places with me. And moments in those places have a way of adhering to my memory, reappearing when my mind wanders to sights and sounds of their wildness, their beauty, their mystery. And I now need these places and these memories even more. The beauty of nature has a way of helping us cope with the confounding issues of our times and gives us hope. One such place for me is what I usually simply call “Pungo”. 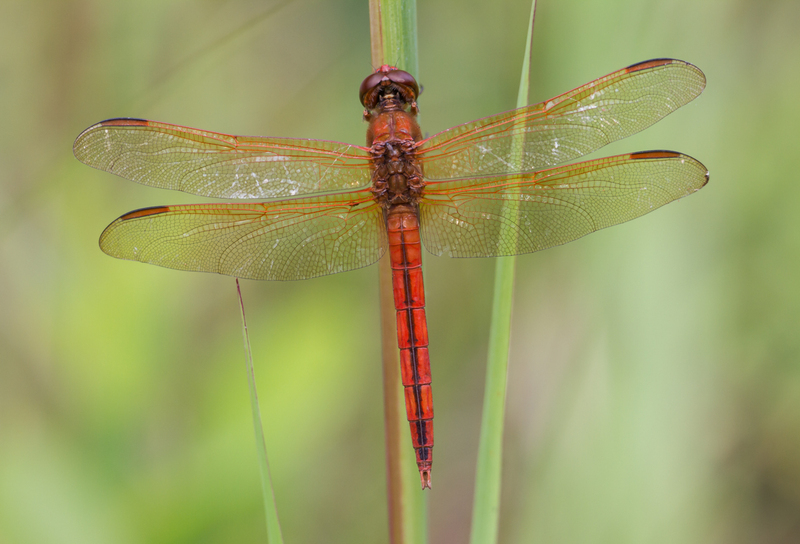 Its official name is the Pungo Unit of Pocosin Lakes National Wildlife Refuge. I managed another trip last weekend, heading down after a program at work on Saturday, and meeting friends from work Sunday morning. I arrived fairly late in the day on Saturday and went straight to North Lake Road. 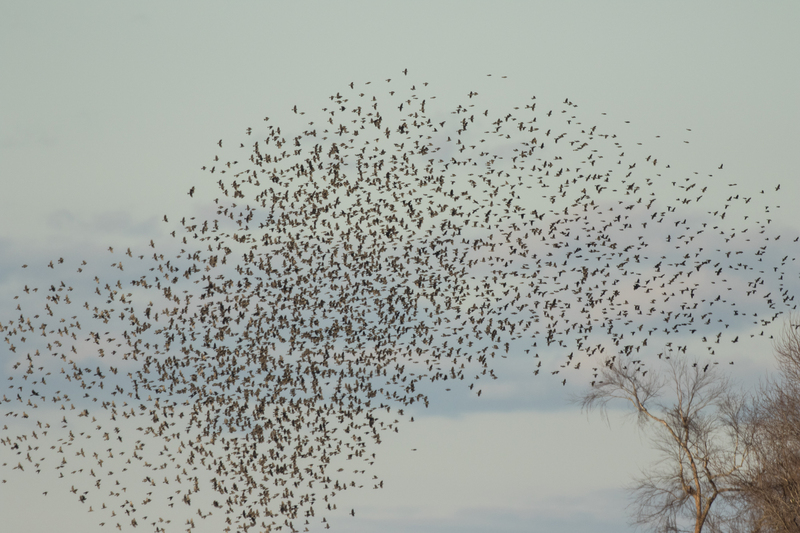 Flocks of blackbirds (mainly red-winged blackbirds and common grackles) were flying back and forth from the corn field to the trees, twittering as they flew in wave-like patterns in response to aerial predators (real or imagined) or some other cues. I ran into some friends and we had a nice flyover of snow geese that couldn’t make up their minds where to go. Melissa was down last weekend also, leading a Museum trip, and I found that group on the way out. We parked and watched swans returning to the refuge for the night along with the swarms of ducks (called ducknados by a young observer a couple of years ago) flying into the corn fields from the adjacent swamp. 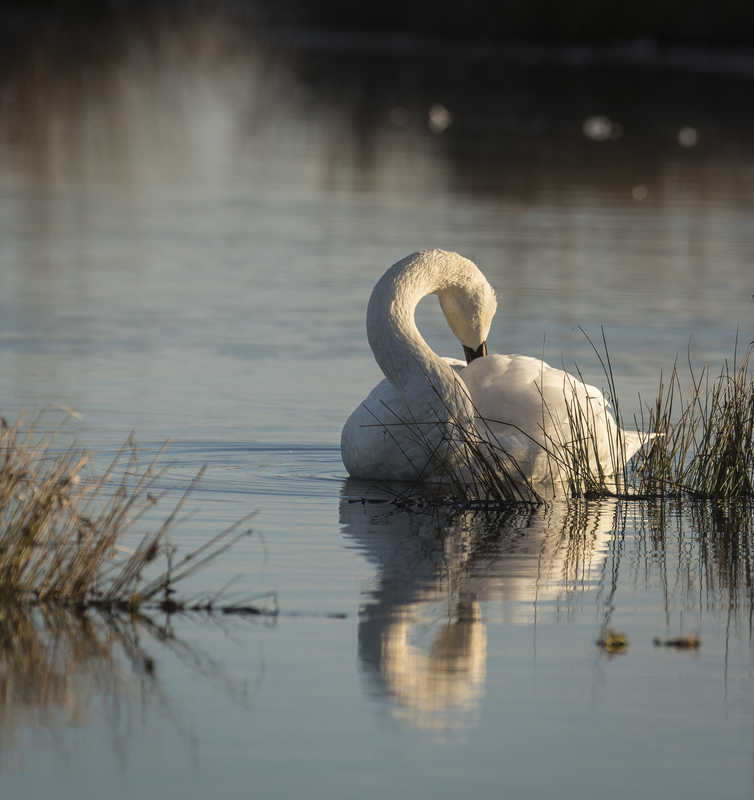 The next morning found me sitting in the quiet of a Pungo sunrise with the soft cooing sounds of swans. There is something magical about sunrises, the way they slowly change the landscape – the silence, the peacefulness. I decided to walk down to the Duck Pen observation blind hoping to see some swans in close. 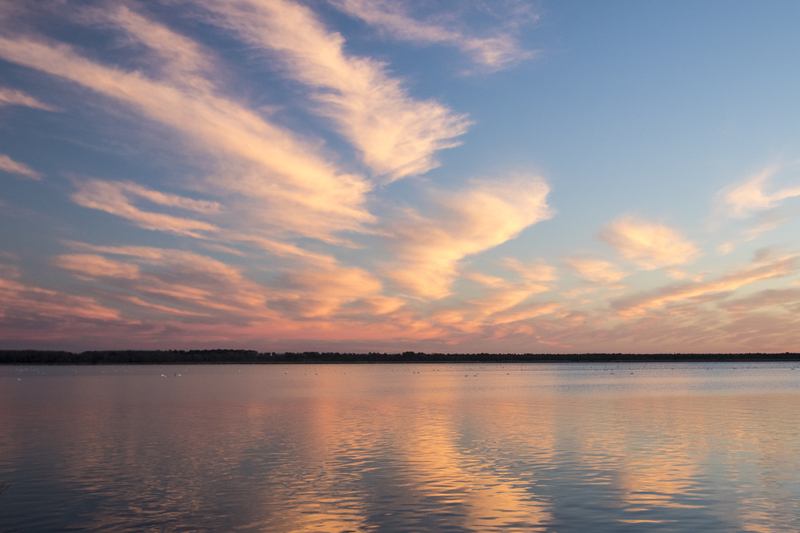 Instead, I was treated to a beautiful sky over the calm waters. A long swooshing sound turned out to be an approaching flock of red-winged blackbirds undulating westward to the corn fields. …and occasionally get one stuck on their bill (probably the equivalent of that piece of lettuce that your friend tries to tell you is stuck in your teeth). I truly enjoy spending time with the swans. But, my friends were going to arrive soon, so I decided to drive around and get a few pictures of other birds (or whatever I could find) while the light was so nice. 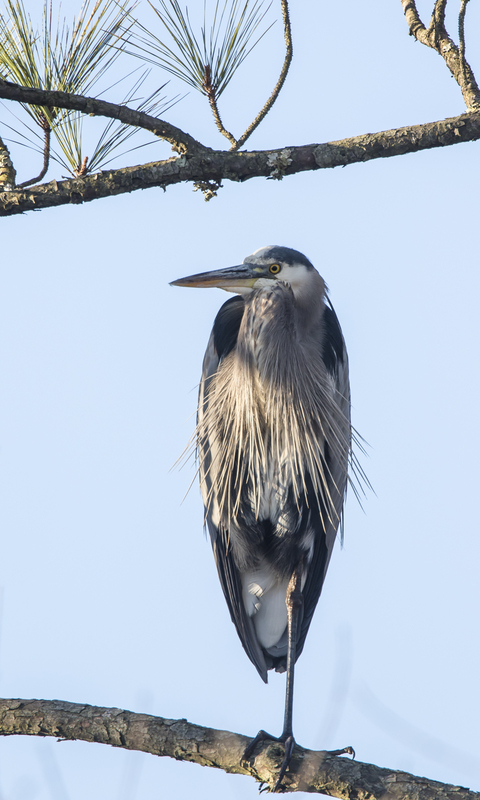 I drove slowly along the canal edges looking for brushy spots that often harbor a variety of small birds. 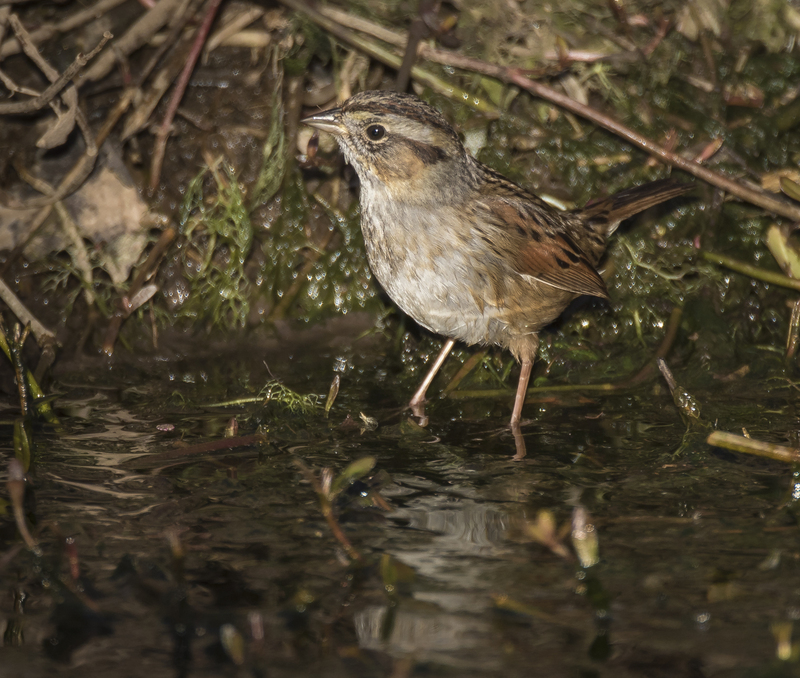 The usually secretive swamp sparrows were feeding out in the open along the edge of the water. If you take the time to look at sparrows, they really are elegant little birds, each species with a distinct personality and a blend of subtle colors and patterns. 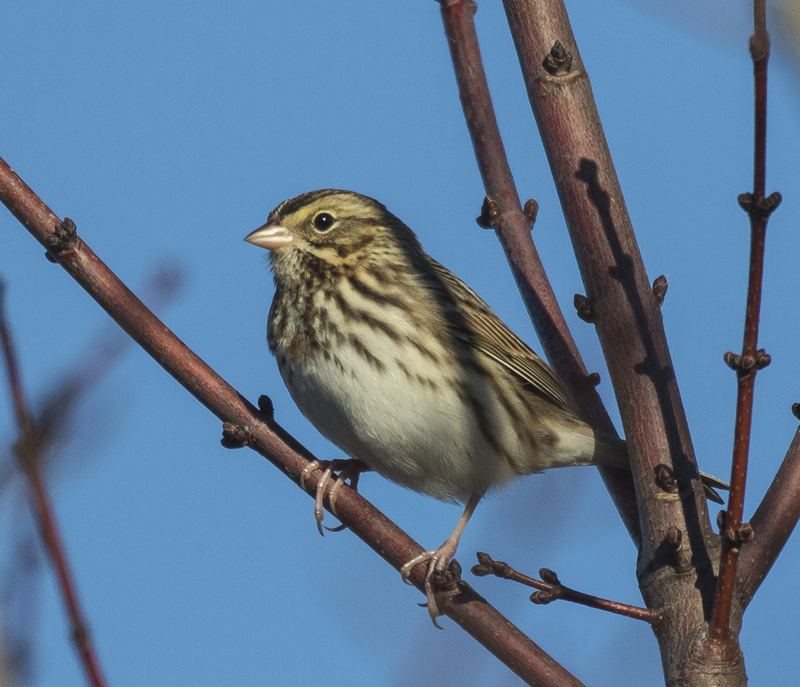 As I drove along the field edges, groups of Savannah Sparrows flitted up from the corn stubble and grasses into the shrubs and trees lining the canals. I appreciated a chance to view them against the sky rather than camouflaged in the grasses. The calm winds and clear skies made for a good vulture day. There are a few large turkey vulture roosts along the road edges at Pungo, so it is common to see them perched in snags along the roadsides in the morning, waiting for the warmth of the day to create thermals for their efficient flight. 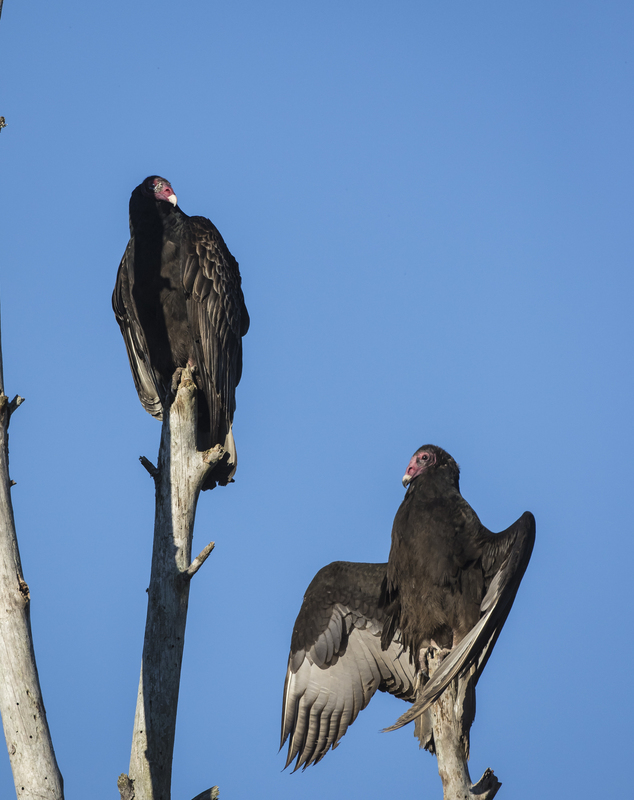 One member of the pair above demonstrated a common vulture behavior – the spread wing posture. This is often seen early in the day as birds try to warm up or dry their feathers after a damp night. One vulture allowed me to drive up closer than most, so I was able to get a few portrait shots (maybe not your dream photo, but they are interesting nonetheless). There is a stark beauty in their ugliness, a lot of detail and character in their wrinkled faces. 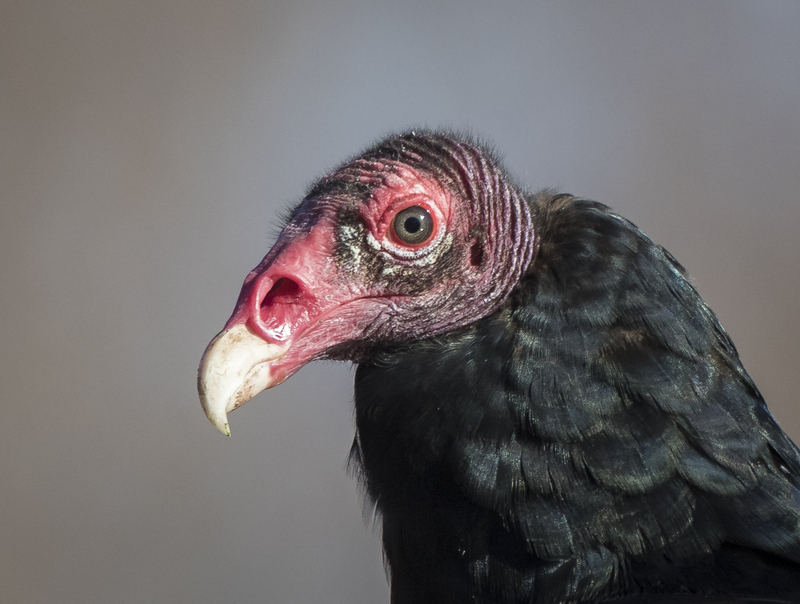 Adult turkey vultures have reddish skin (juveniles have blackish-gray skin) and an ivory bill. You can also see their huge nostrils (nares) which help them have one of the keenest senses of smell in the bird world. They also have a larger olfactory lobe in their brain compared to other species so they are well-equipped to detect dead animals as they soar above the landscape. As I drove along D-canal road, I spotted a few vultures squabbling over a duck or goose carcass in the private fields across the canal. 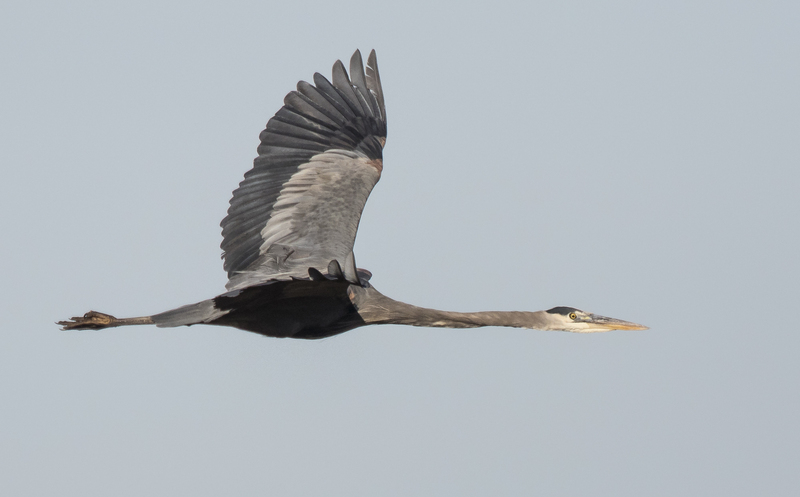 As I watched, they suddenly took flight, along with a great blue heron that had been stalking prey in the nearby drainage ditch. …an adult bald eagle had flown into the trees behind me, no doubt alerted to the possibility of a meal by the gathering vultures. Though I waited patiently for 30 minutes, the cautious eagle maintained its perch, waiting for me to move on, which I finally did. When my friends arrived, we piled into one car and continued searching for wildlife. Our first stop was to view the swans. Warm days seem to make the wildlife lazy, content to hang out longer, making some species a bit tougher to find. But lazy winter days also make some species, like turtles, easier to see. As we drove along, there were turtles (mainly a mix of painted turtles and yellow-bellied sliders) basking on almost every log. 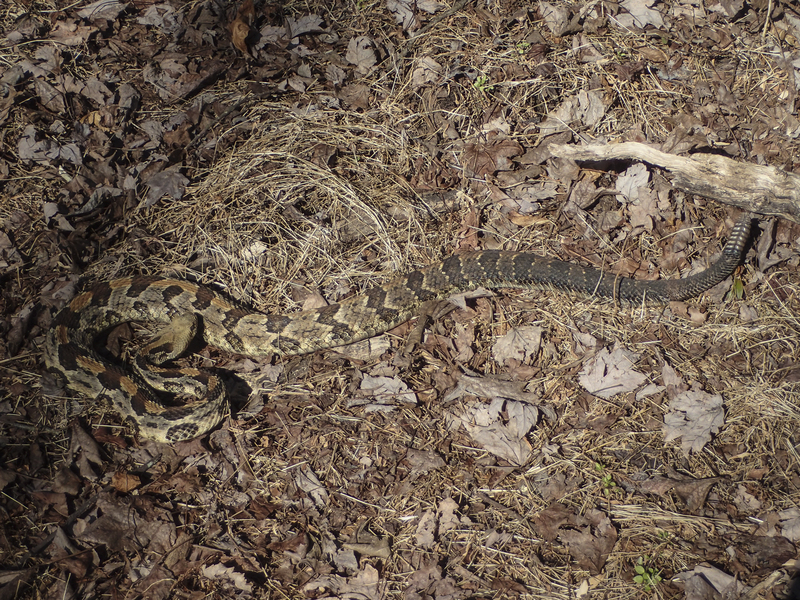 That made me both wary and excited as we entered the woods, for this is the kind of day you might see a snake, especially “my snake”. 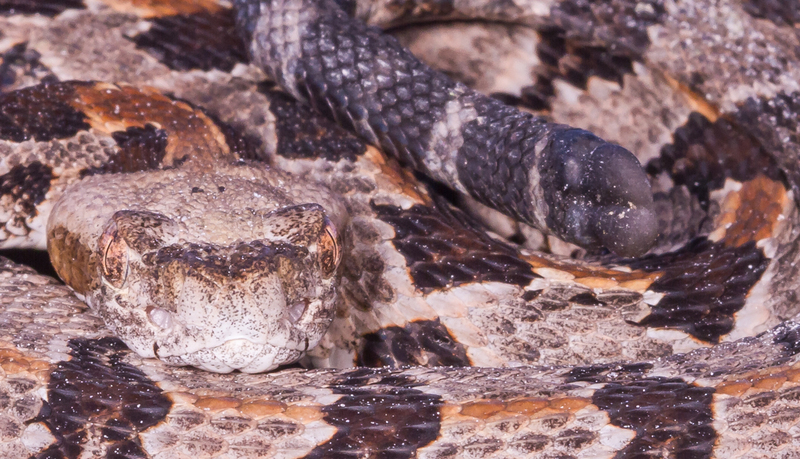 I had stumbled upon the large canebrake rattlesnake again last weekend during the Christmas Bird Count at the same hollow tree as 3 years ago. 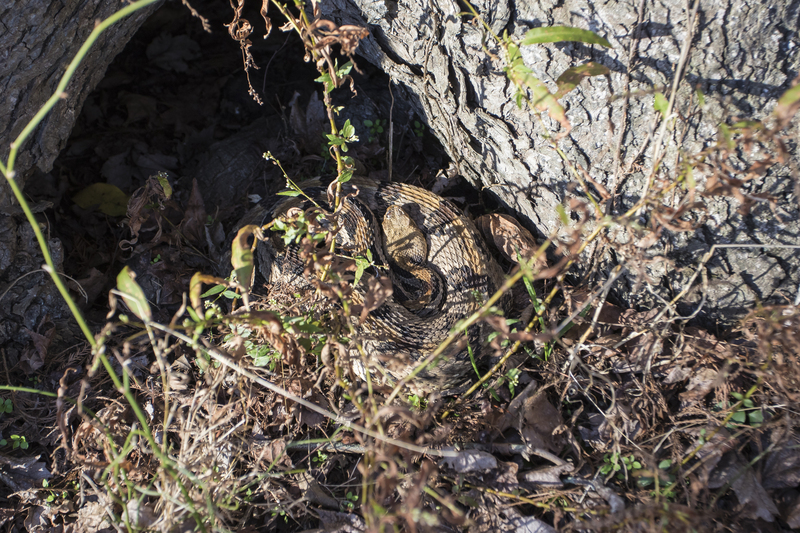 We hiked slowly to the tree, looking carefully around the surroundings in case the rattler was out enjoying the warmth. After looking all around the area without spotting it, I knelt down and shined my flashlight into the hollow – no snake. I moved to the right, and shined the light in the other hollow – nothing. 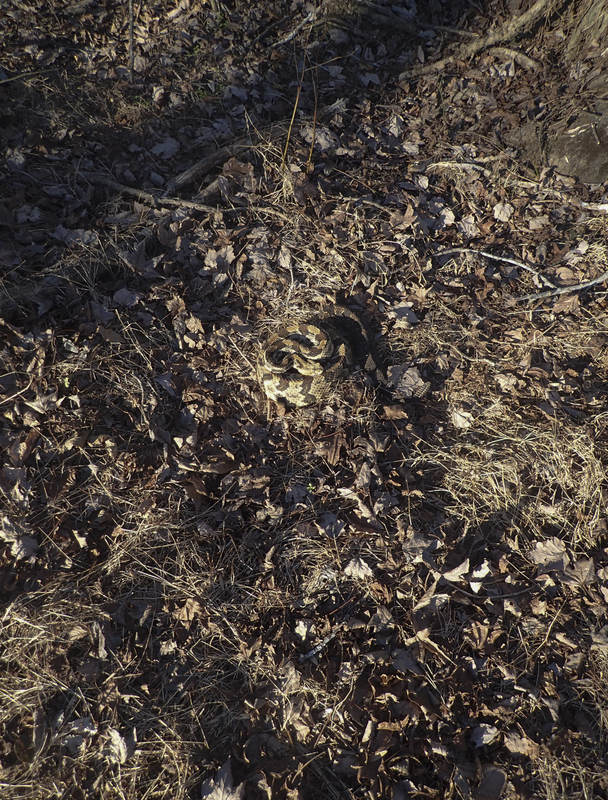 Suddenly, my eye caught a familiar pattern…there it was, a few feet from me, curled up at the entrance, partially hidden behind the grass and vines that now block part of the hollow. I seem to have a strange affinity (and partial blindness, apparently) for this snake. The others in my group couldn’t see it at first, and then, one by one, they spotted it. We all jockeyed positions to get a better angle to view the snake which was partially obscured by the vegetation in front of the hole. 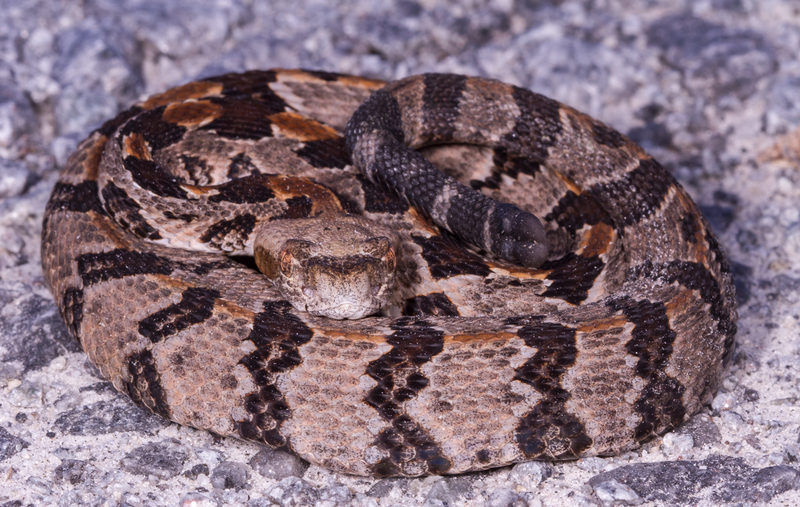 This rattler (it probably is the same one from previous encounters at this tree) has not lived up to its name, having never rattled in any of my encounters with it over the past few years. I must admit, I wouldn’t mind a little noise the next time we meet. 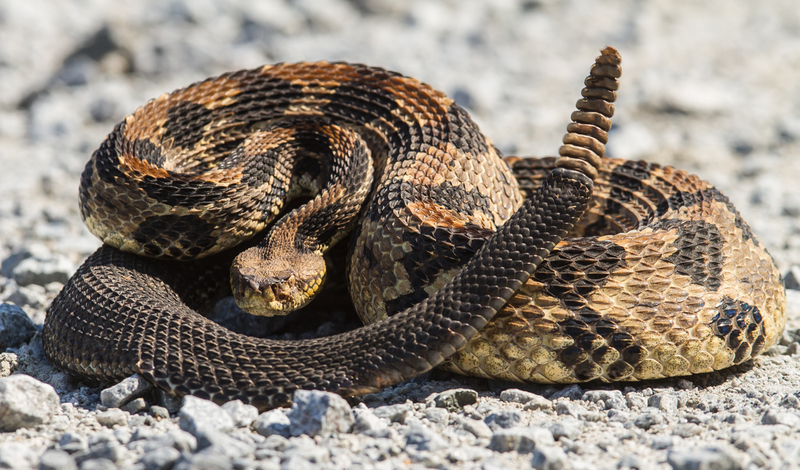 Even with all the commotion from its admiring crowd, the rattlesnake remained still, no doubt confident of its ability to defend itself from this group of interlopers. We wandered on, wishing it well until we meet again. We headed back out to the road, hoping for a flyover of birds from the lake. 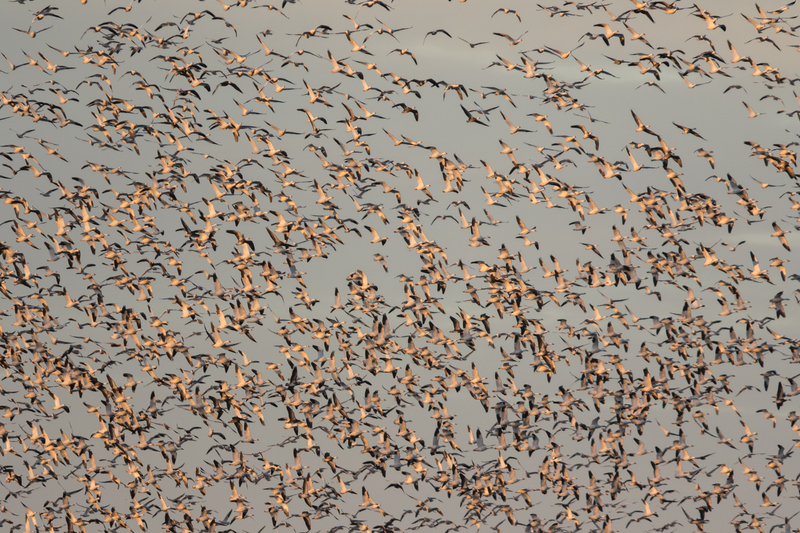 The evening before, the snow geese had flown out and around a few times, but not landed. As we walked back to the car, we heard them coming. We paused as they flew over toward the far corner of the corn field. At first, a few hundred. That flock went back to the lake and returned with a few thousand. More joined the flock as they began to circle the fields. Some would spin off toward the lake, but more kept coming in, until perhaps they felt they had enough critical mass to make a decision – to land in the field. They finally started to drop down into the corn and thousands more birds came in from the lake to join the circling mass. Finally, several thousand birds were feeding in the corn. After what seemed like a very brief meal (considering all the energy they burned flying around beforehand), they all lifted off and headed back to the refuge of the lake. 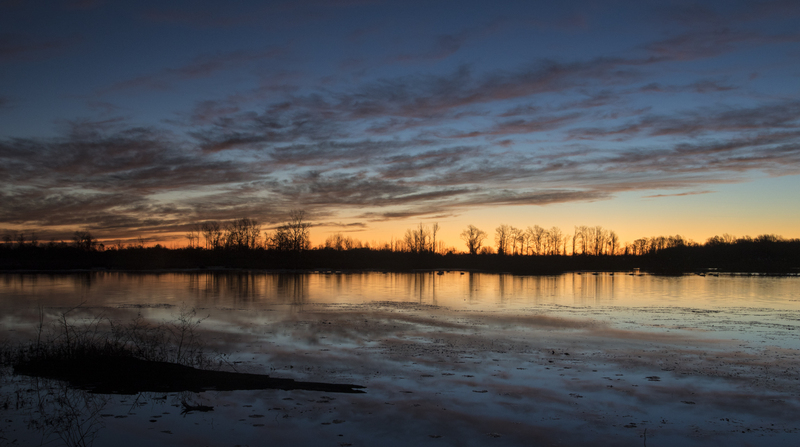 There is nothing like this anywhere else in North Carolina (or anywhere else in the East for that matter)…thousands of birds filling the sky, golden light tinging their undersides as they noisily fly over you. The true meaning of spectacle, and the reason I keep returning to Pungo. Watching the animals come and go, and feeling the land swell up to meet them and then feeling it grow still at their departure, I came to think of the migrations as breath, as the land breathing. What a difference a week makes. 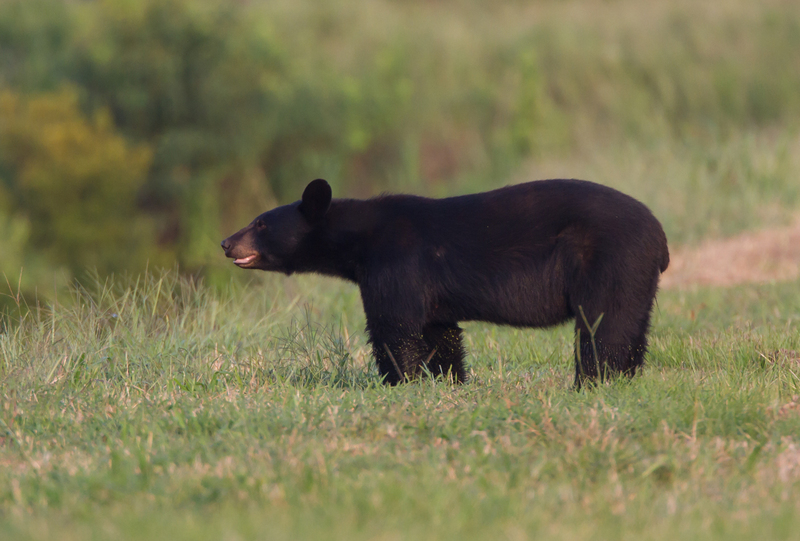 Less than seven days had passed between my last two groups, but things have dramatically changed at Pocosin Lakes NWR. The snow geese had arrived later than normal this year, and now have left earlier than usual. Where there had been 40,000+, we saw one. 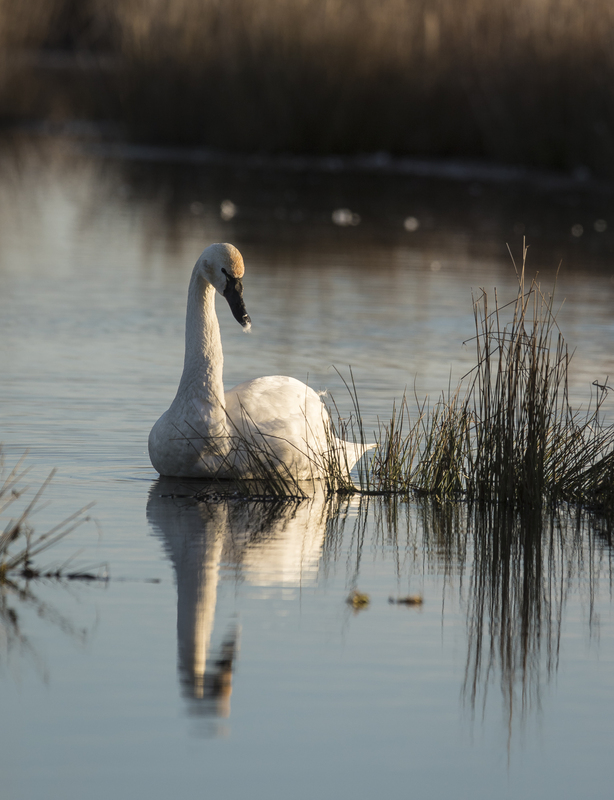 And, it seems, the tundra swans may be departing the refuge a little early as well. There still seem to be a few thousand, but their numbers are way down from what we saw back in late December, and almost none are feeding on refuge lands. The warm weather, and what appears to be less corn and winter wheat on the refuge, may be to blame. Or maybe, as Barry Lopez so eloquently puts it, the land is simply breathing and exhaling the geese northward. But, there are still things to discover and enjoy, if you look closely. I arrived early the day of my tour, in hopes of finding some interesting things to share later with my group. 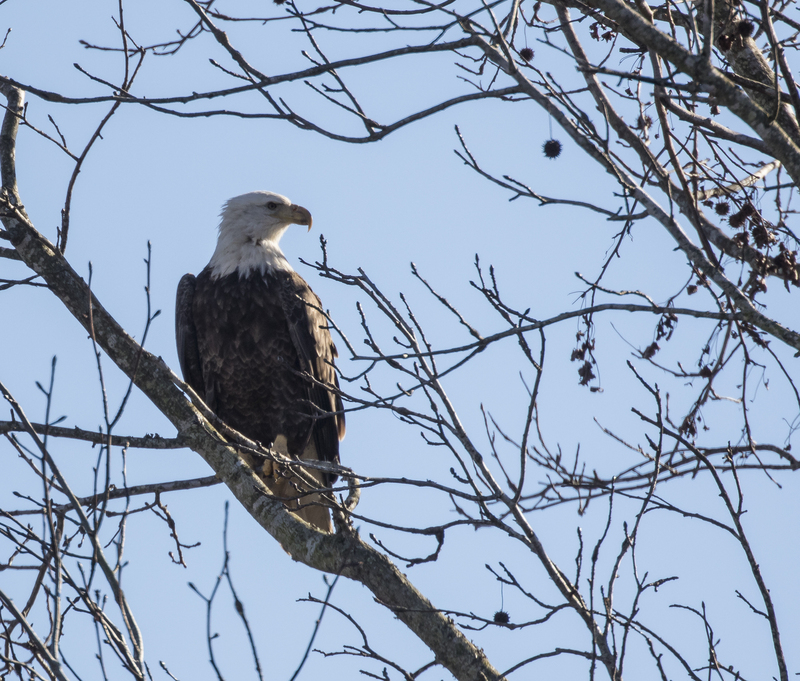 With the snow geese gone, the eagles are not as numerous as in recent trips. 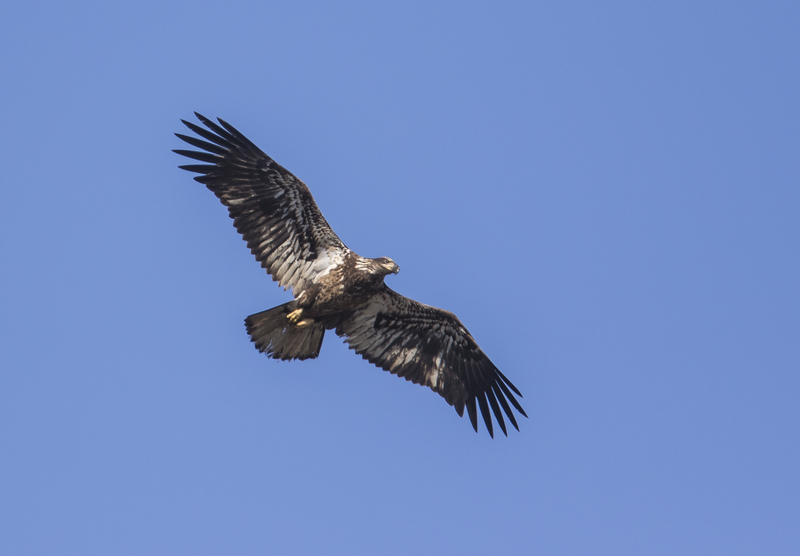 But, a young bald eagle (looks like a first year bird based on the plumage) still gave me a nice fly over shortly after my arrival. 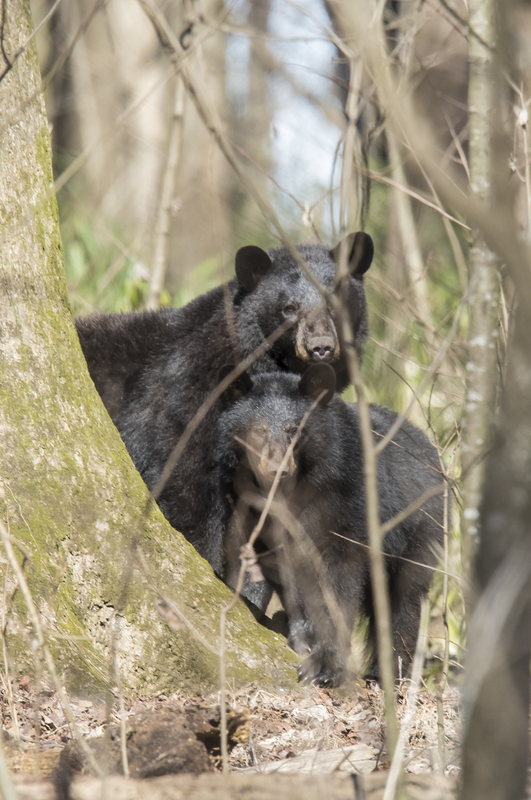 I took a short walk into the forest and was rewarded with a couple of black bears, including one large sow. I took a few photos but quickly left, after requesting that she and her two youngsters hang around for another few hours. I have been hearing the great horned owls calling in a patch of woods on previous trips so I was went looking for any sign of a nest. I have found two other nests on the refuge over the years. One was in a pine in what was probably an old red-tailed hawk nest; the other atop a snag with a platform of poison ivy vines spreading out from the top. I finally spotted a large stick nest in the fork of a lone pine tree. I didn’t see anything at first, but then noticed a feather on the side of the nest blowing in the wind. When I put the spotting scope on it, it looked like an owl feather. 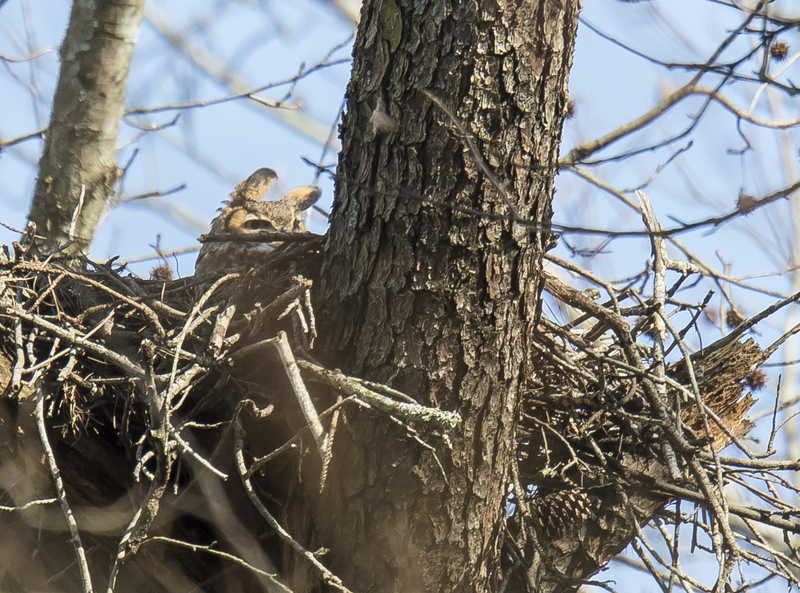 I moved around for a different view and saw what looked like ears sticking up above the nest. 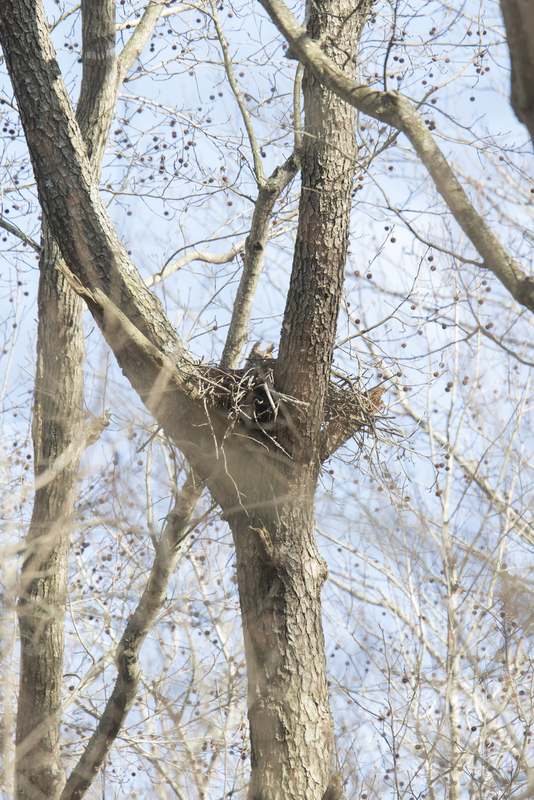 The scope revealed it to be the ear tufts of a great horned owl, most likely sitting on her eggs, as this species is probably the earliest breeder in our state. I stayed well away from the nest so as to not disturb her. I can check on the nest on future trips with the spotting scope without getting close. 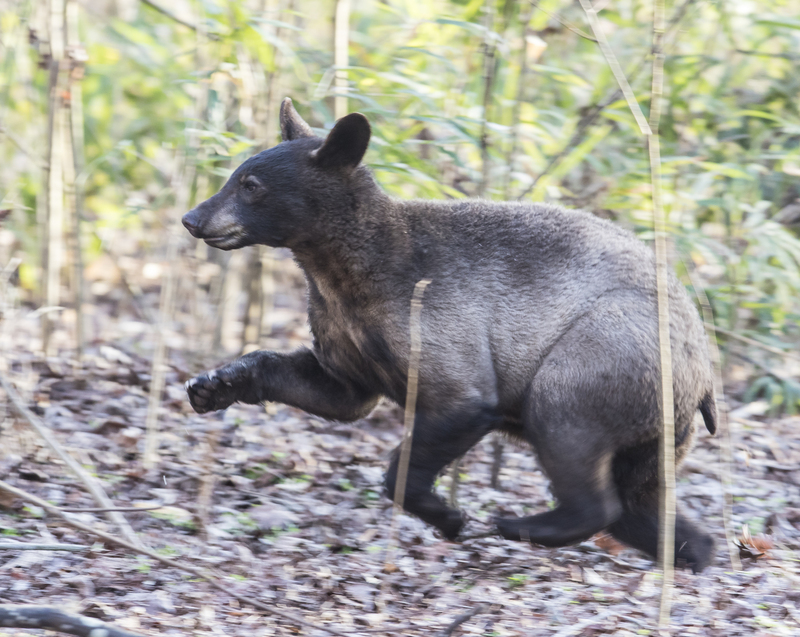 This is a good time to remind readers that almost all of the photos of wildlife in this blog are taken with a large telephoto lens, and are cropped in processing, so the animals are not as close as they sometimes appear. When my group arrived, we headed back to check on the bears and the owl nest. 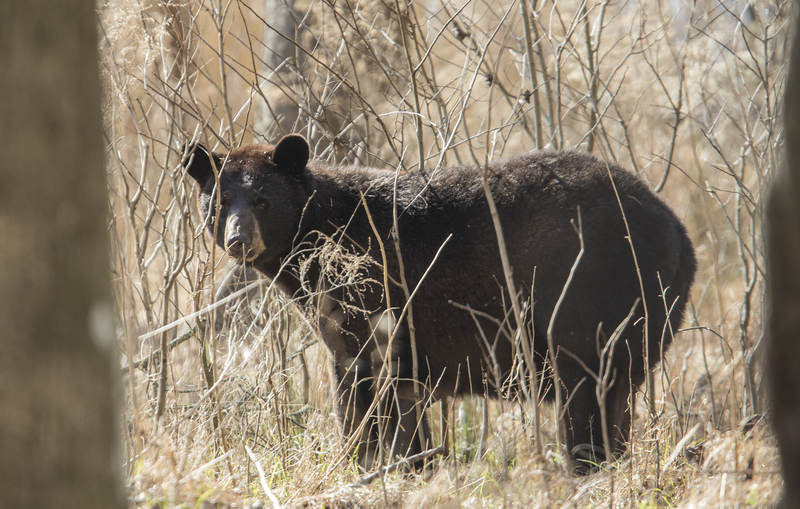 It seemed as though the bear had heeded my wishes and was walking toward us as we headed down the path. We stopped and she wandered off, followed by two young, both sporting a distinctive grayish coat. 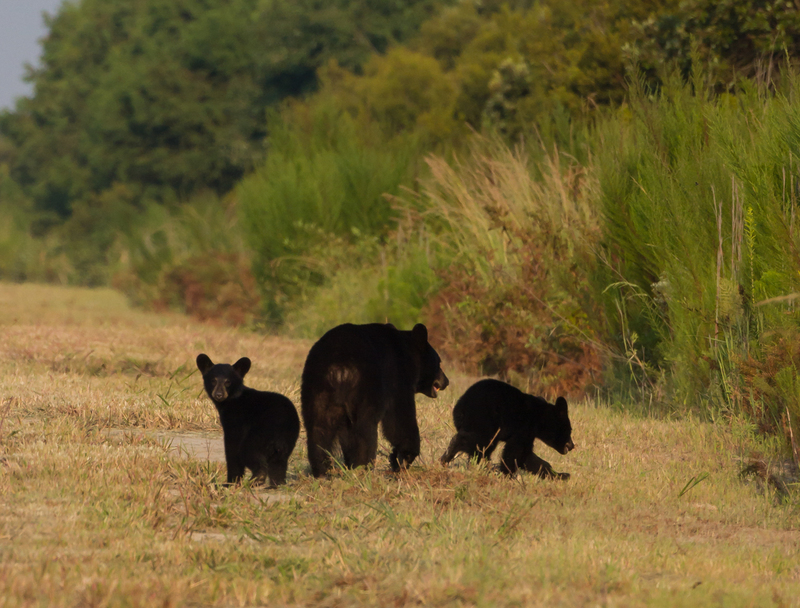 Then, another bear crossed the path, followed by three more bears! Quite a start to our trip. At least some of these same bears hung around that general area for the next day as well. We saw another group on our hike the next morning. I always try to give the bears plenty of room. 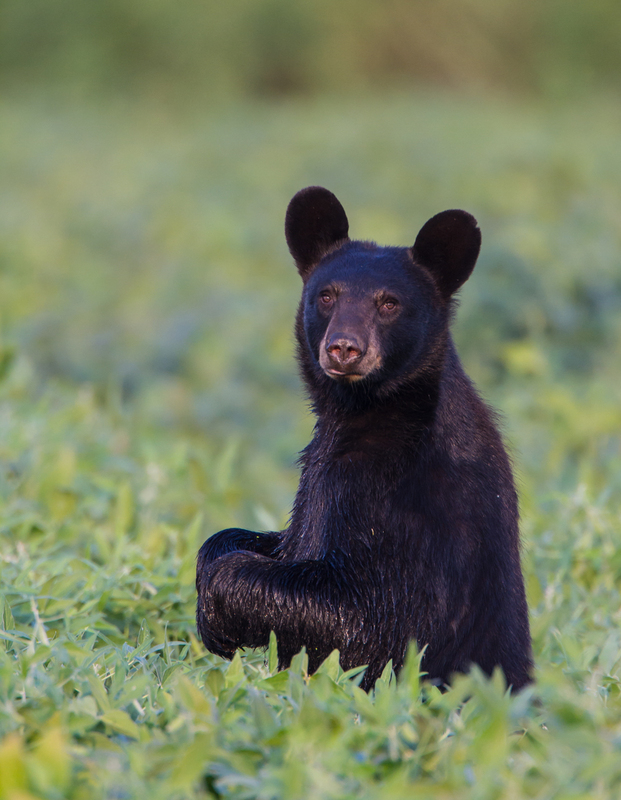 We are quiet and try to stand still when we see one, and I like to let the bears take whatever path they want. I have seen people try to cut them off in order to get a closer look or a better picture, but it is best to respect their wildness, and let them be. Enjoy the experience, but keep the bears unstressed and wild. 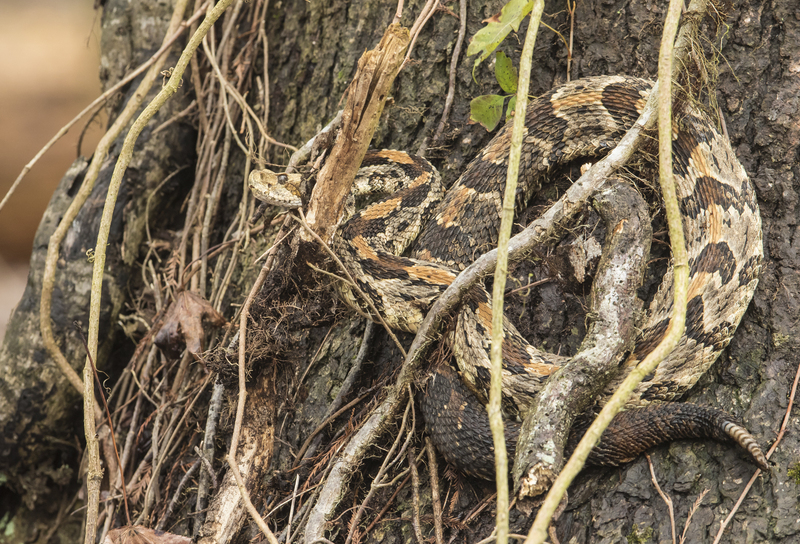 The other thing I wanted to check on was the tree where I had seen the rattlesnake two weeks earlier. I carefully checked the area around the tree as I approached, knelt down and shined a light inside the base – no snake. Not too surprising as it had been a cold night and there was even ice in tire ruts on the road when we walked in. So, with all the bears in the area, I started to walk down the path, looking ahead for any signs of bears through the trees. 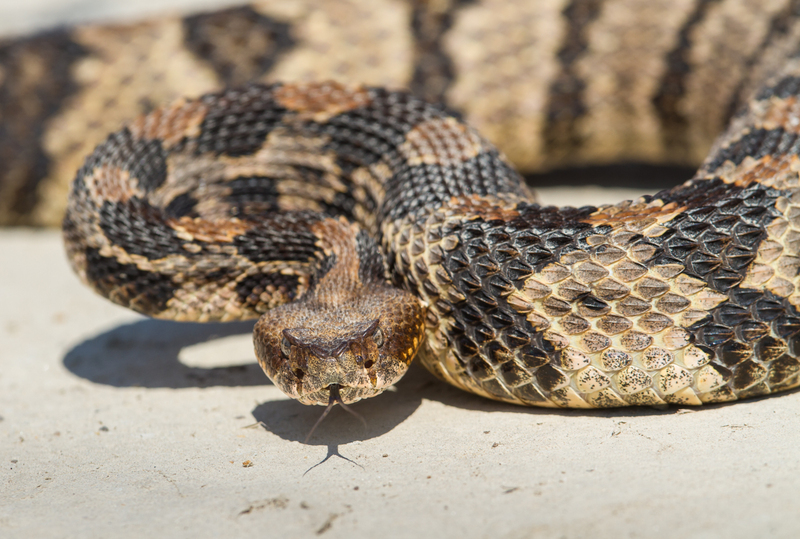 The next thing I know, I had what can only be described as a too-close-of-an-encounter with that snake, who was luckily quite docile in the chilly air. We took a bunch of photos and then left the snake alone. We checked on it the next day, after seeing even more bears, and found it a little more active in the warming weather. It was slowly crawling in roughly the same area where we had seen it the day before. 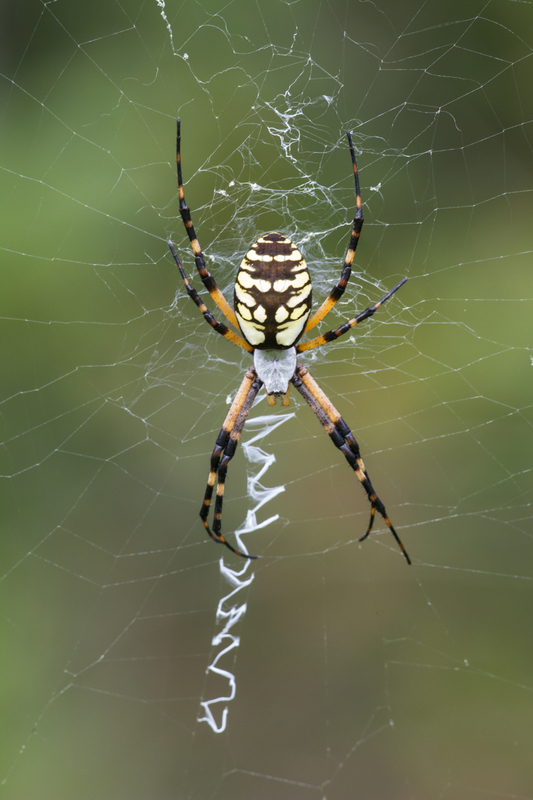 This is a beautiful specimen, and apparently a tough one, as it doesn’t seem to mind being out in some pretty cool weather. Today, it chose to lie in a sunny spot, soaking in the morning warmth. We took some more pictures and then left it alone. I can’t help but wonder how it will fare if a bear encounters it in this cool weather. I also can’t believe I may now need to look at the ground more carefully as I walk these winter woods, instead of constantly scanning the skies for waterfowl and other birds as I have done for over thirty five years. Strange times indeed. My first morning at Pungo I saw a buck white-tailed deer, with only one antler, running through a field. It is that time of year when male deer are dropping their antlers in preparation for starting the new growth later this spring. 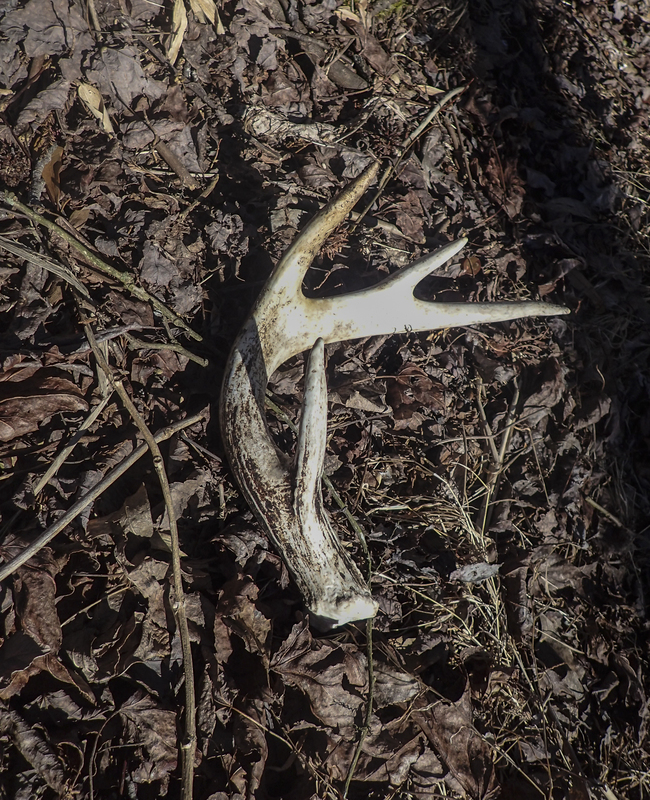 As it turned out, we found two different shed antlers as we walked. You are most likely to find them shortly after they are dropped and before squirrels, mice, and other animals start chewing them up to get the calcium. 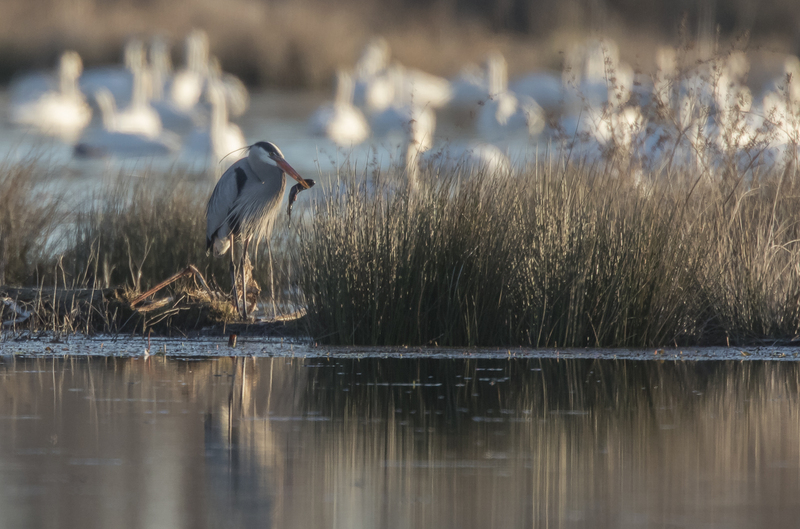 While watching the swans one morning, someone in the group spotted a great blue heron with something in its beak. It turned out to be a large catfish. We watched as the heron repeatedly tried to swallow the large meal. We think it finally gulped down its meal before flying off to hunt again. 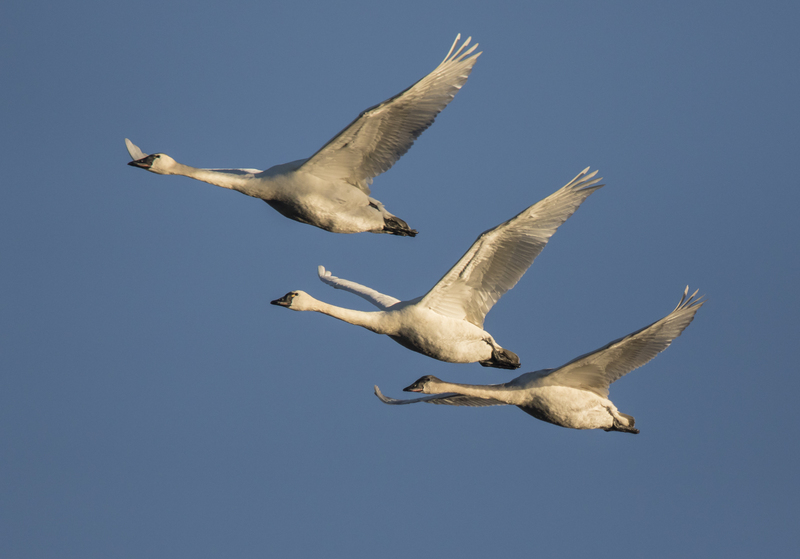 Tundra swans flew back and forth overhead as the day progressed so we had plenty of good looks and photo opportunities. 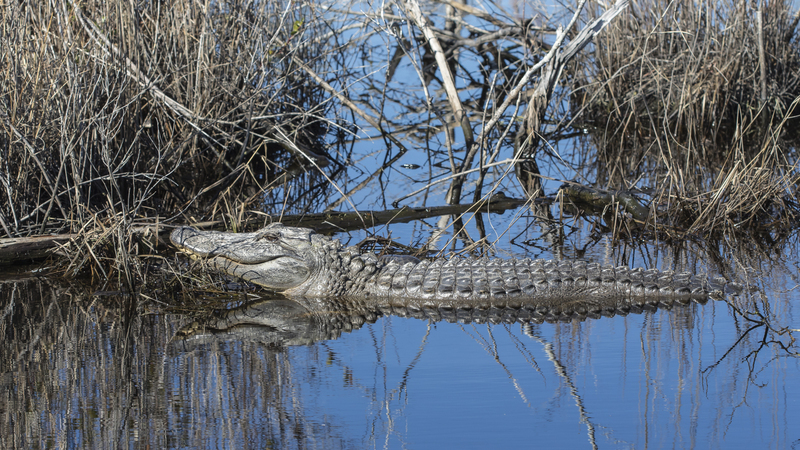 We split our time between the Pungo Unit of Pocosin Lakes NWR and Mattamuskeet. 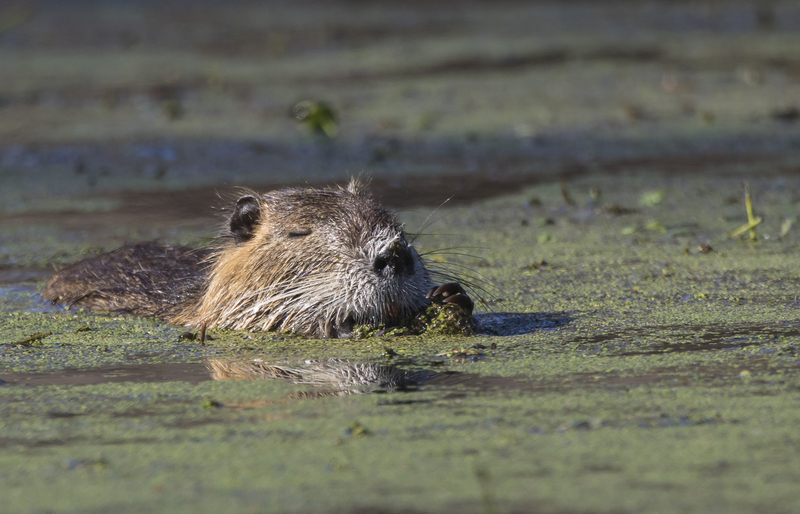 As the weather warmed over the weekend, we saw a lot of nutria out feeding. Driving along Wildlife Drive, we saw hundreds of ducks and swans, along with a variety of other birds. Late Saturday afternoon we enjoyed seeing vultures come into roost in trees near the lodge. 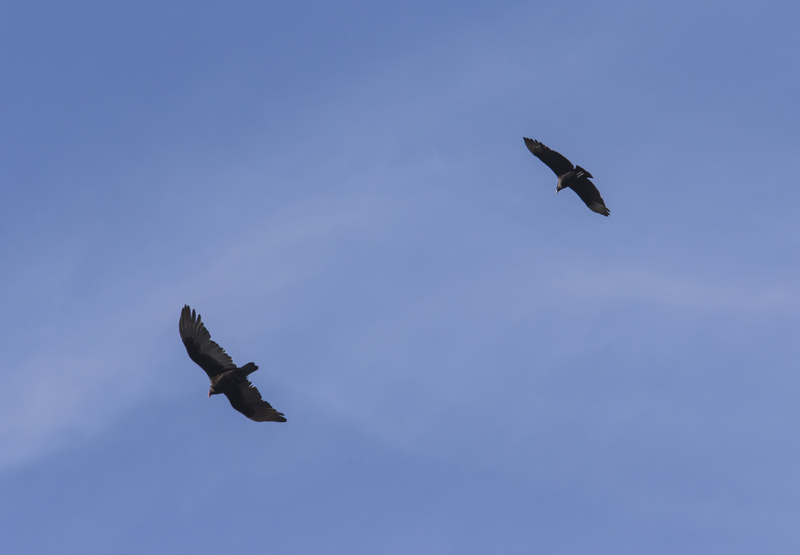 At one point I grabbed a photo of a turkey vulture alongside its smaller cousin, a black vulture. The latter looks as though someone had trimmed its tail feathers (relative to a turkey vulture). Black vultures are also smaller and tend to flap their wings more than a turkey vulture. 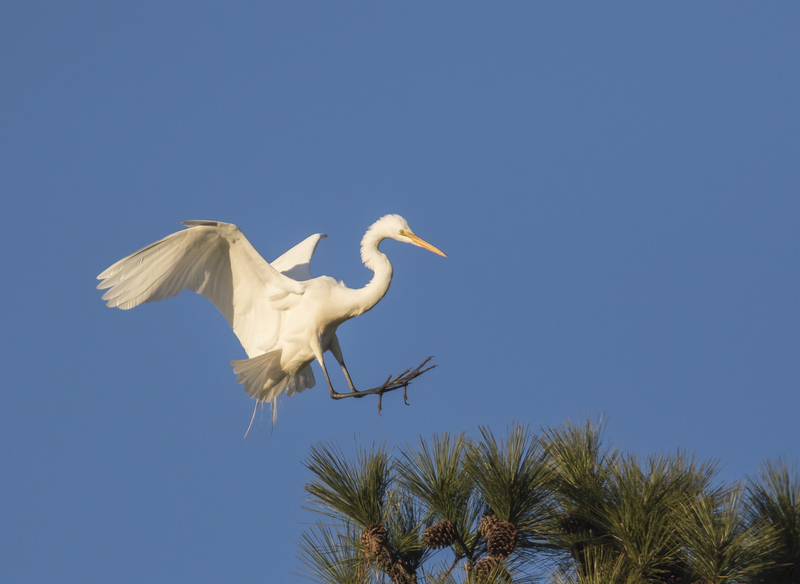 The late hour also brought in several great egrets, white ibis, and some cattle egrets to roost in the trees across the canal from the lodge. This spot has traditionally been a roost for black-crowned night herons, but I have seen none of them in these trees this winter. One of the biggest eye-openers of the trip came on our last afternoon as we explored some new territory down toward Gull Rock Game Lands. 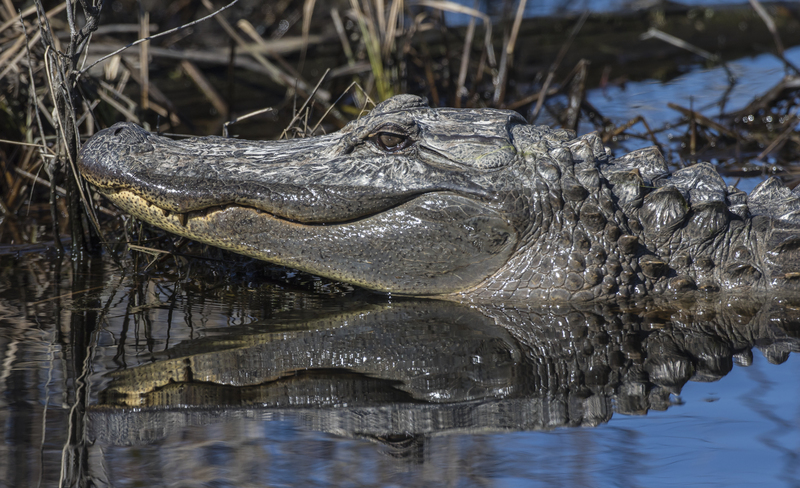 In a canal bordering a wetland containing ibis, a grebe, and a double-crested cormorant, we discovered another surprising January reptile – an American alligator. 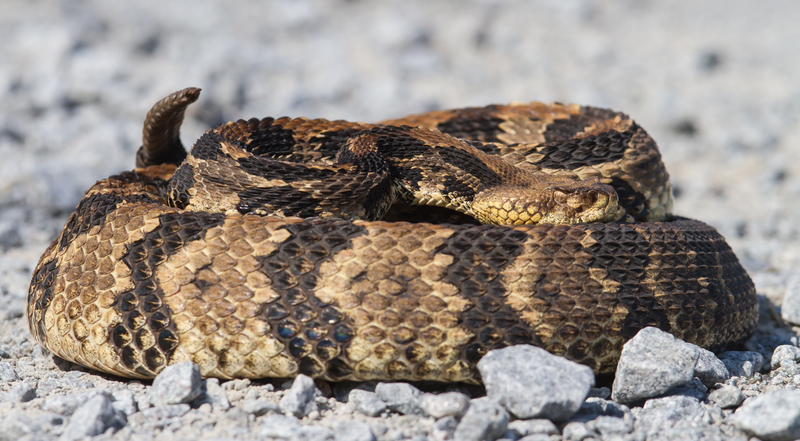 It was about a 6-footer, basking in the sun, and seemingly unconcerned about the three cameras being pointed at it. And so this month of wildlife wonders has come to a close. A strange month indeed, but an exciting one. 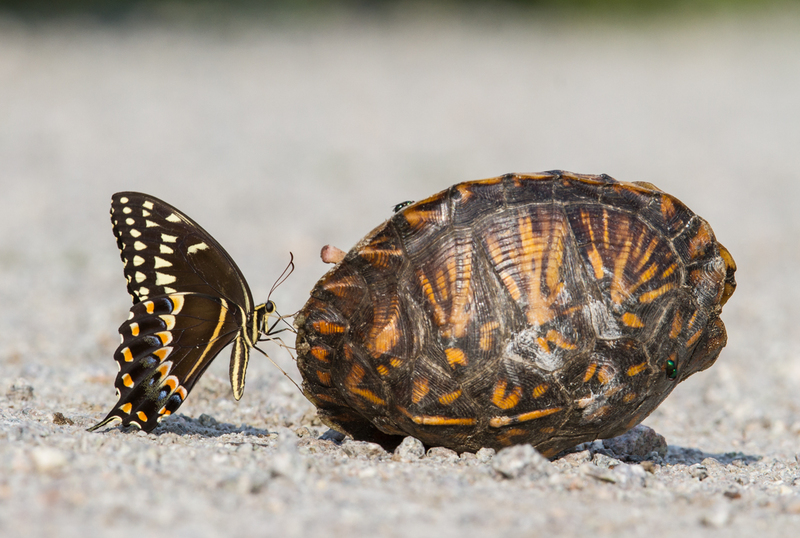 One other critter worth mentioning that we saw on the last day of January – an orange and black butterfly near the lodge at Mattamuskeet. It was flying away from me when I spotted it out about 75 feet, but through the binoculars it looked like a monarch, not a viceroy. Either one is a big surprise for a winter day in North Carolina. It seems the land is breathing a bit oddly this season. I wonder what the coming spring will hold? For hibernating rodent and hidden turtle, what dreams, I wonder, come on such a day of spring in January? 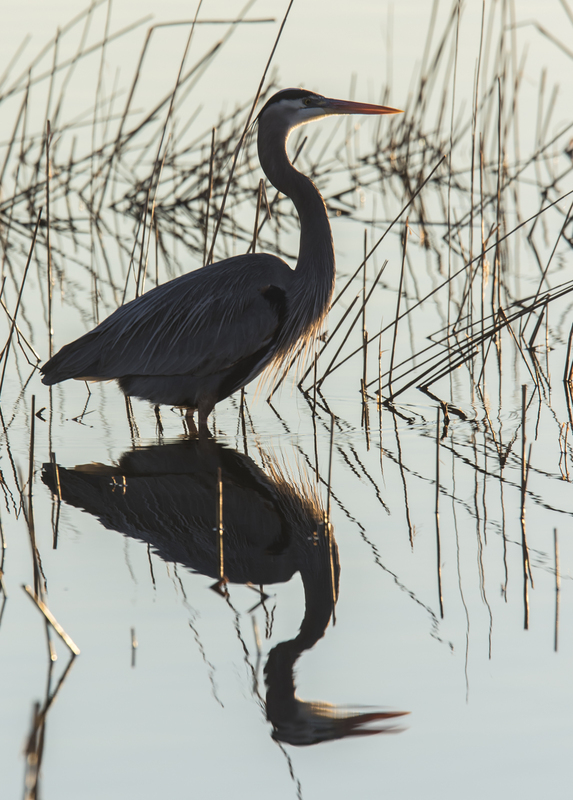 I just returned from several days down at Pocosin Lakes and Mattamuskeet National Wildlife Refuges. The weather started off beautiful, then wet and warm, then cold and windy – quite a variety of conditions in a 6-day span. The trend thus far this winter has been for unusually warm conditions which has lead to some strange wildlife sightings. I reported in an earlier blog on the butterflies we saw on the Christmas Bird Count, and the still active mosquitoes and biting flies. 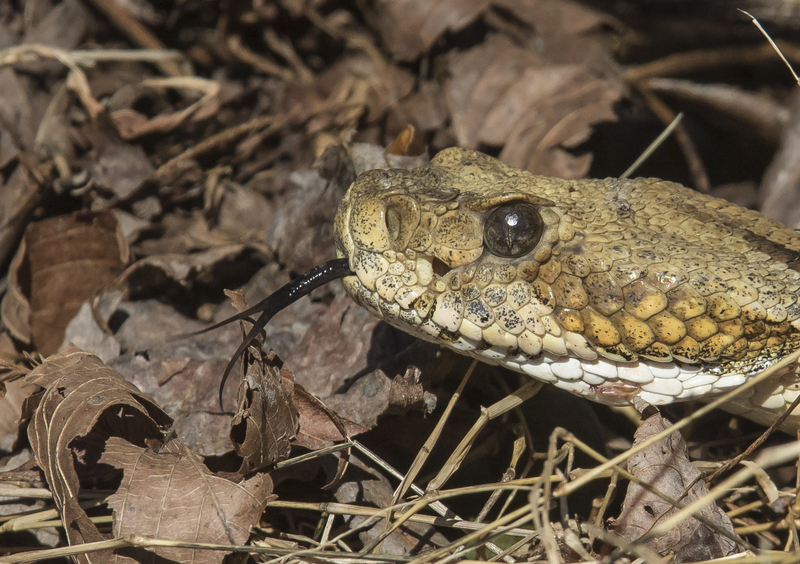 This past Sunday set a new personal record for strange winter wildlife sightings in North Carolina – a 4 species-of-snake-day in January. 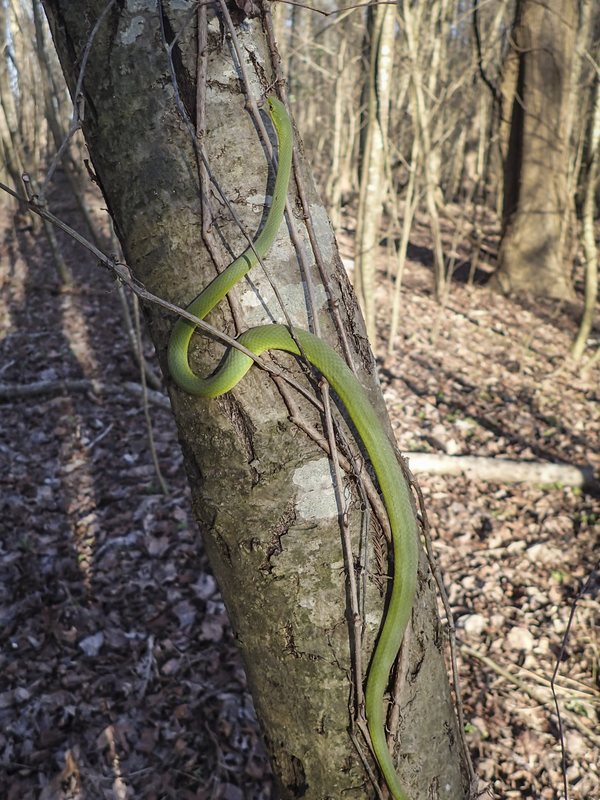 I have seen a few snakes out in December and January over the years (mostly Rough Green Snakes at Pungo), but never 4 species in one day. 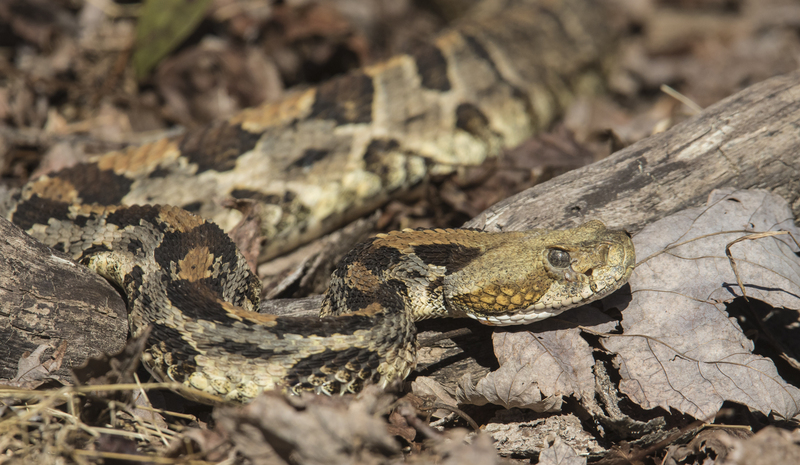 Snakes generally seek sheltered locations when cold weather strikes, but can be seen out, even in winter, when temperatures warm to around 60 degrees Fahrenheit, or more. Last week had a string of warm days, with daytime highs reaching the mid-60’s on Saturday and Sunday. I had a group of photographers and we heard a few frogs calling as we walked around on Saturday, which was rainy and mild. Melissa was down at Pungo with a group of teachers and texted me about an amazing observation. She had walked up to a tree with a hollow base to investigate what looked like some digging at the entrance to the hole. 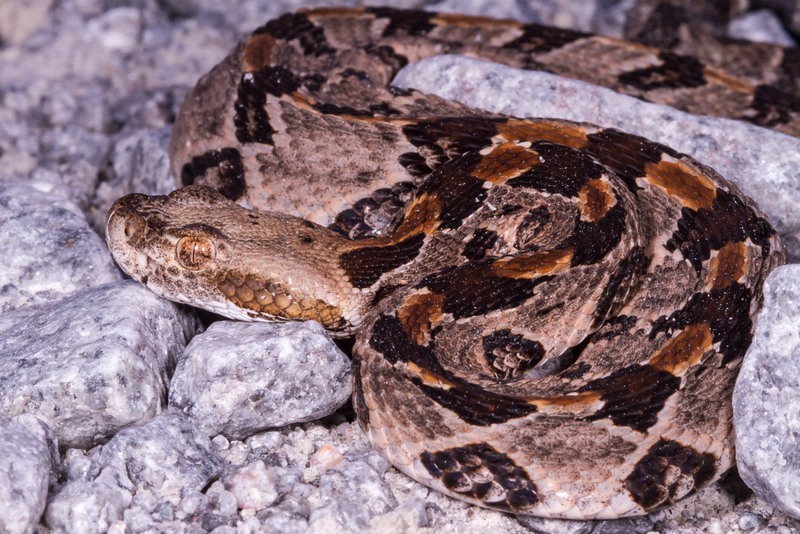 When she looked inside, she saw what appeared to be a large snake, perhaps a Canebrake Rattlesnake, Crotalus horridus. I called her that evening and quizzed her on its location. The next day, I walked my group down the trail to where Melissa had described the tree. As I approached what I thought was the tree, I was at first disappointed, as I did not see a snake. But, then, I noticed something on the side of the trunk – a snake’s tail! 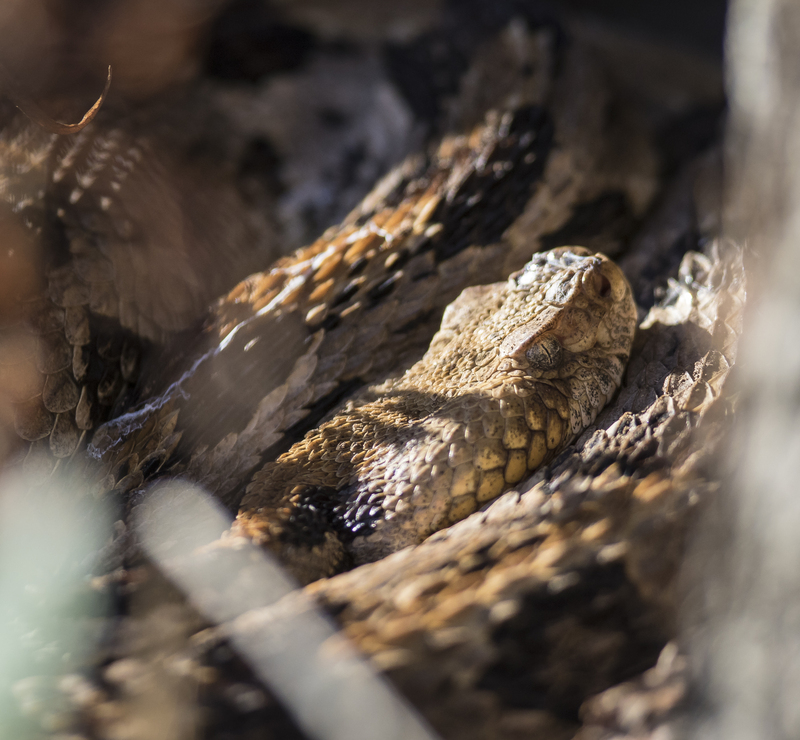 I glanced around the trunk and there it was, a huge, beautiful rattlesnake, wedged between some vines about two feet off the ground. 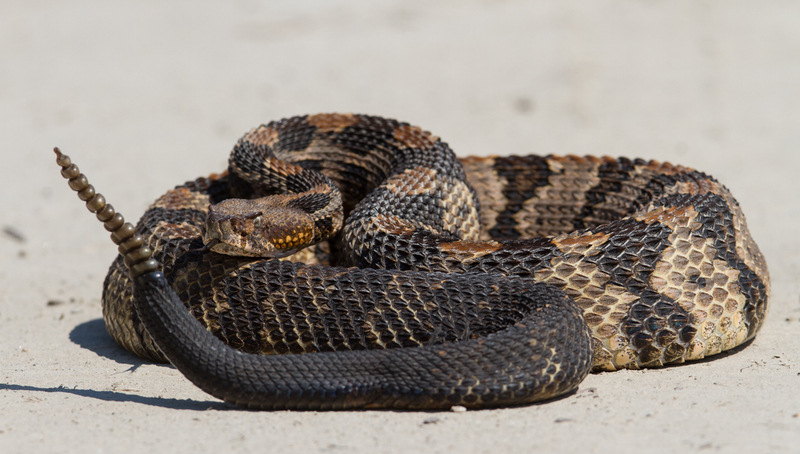 Needless to say, I was excited, and members of my group that had stayed on that morning were provided with a rare opportunity to photograph a winter snake. Little did I realize then that the day held many more reptile surprises. After our walk at Pungo, we headed over to Goose Creek State Park for our final outing of the weekend. 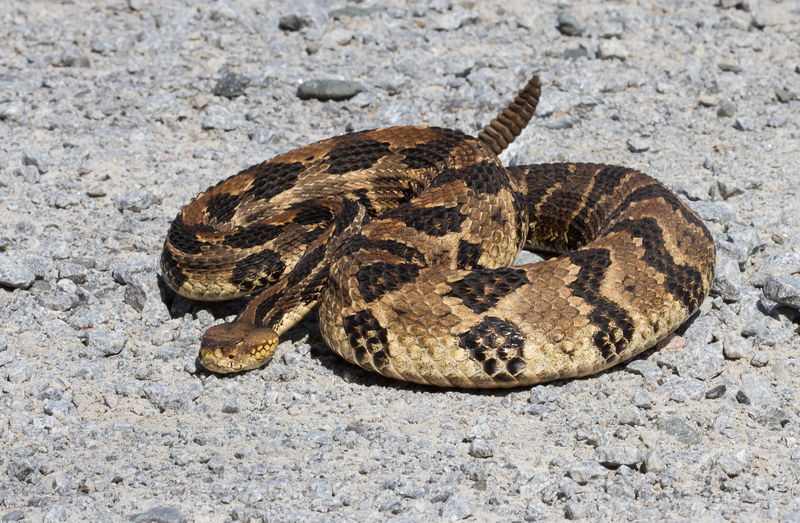 As we walked the long boardwalk behind the Visitor Center, one of the folks in the group called out…”snake”. 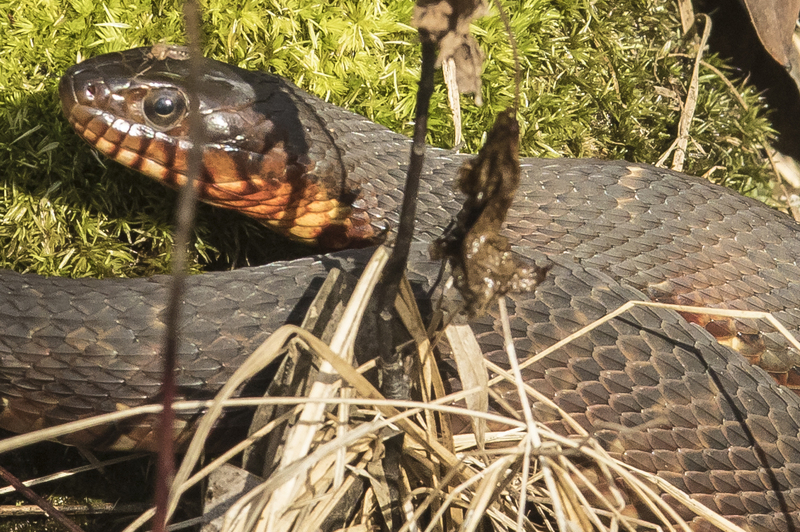 Lying on a clump at the base of a larger tree was a water snake. 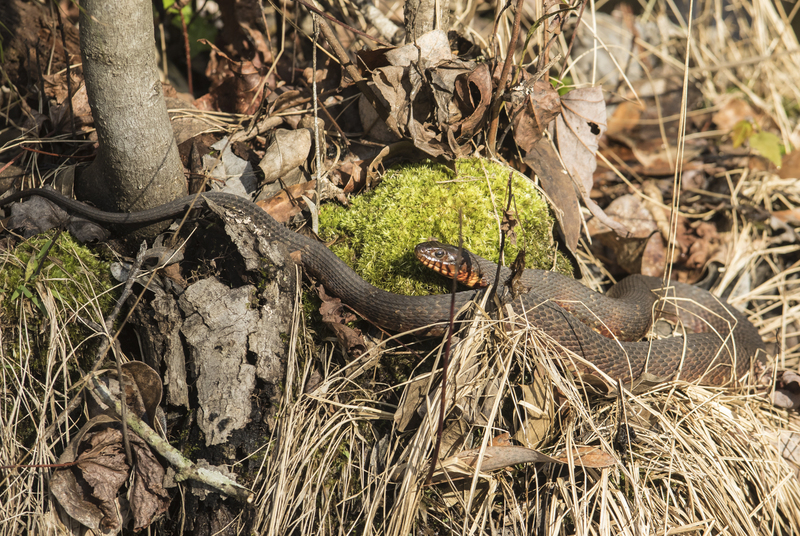 At first glance, I thought it might be a Red-bellied Water Snake, Nerodia erythrogaster, due to the colors on its head and general lack of dorsal markings. 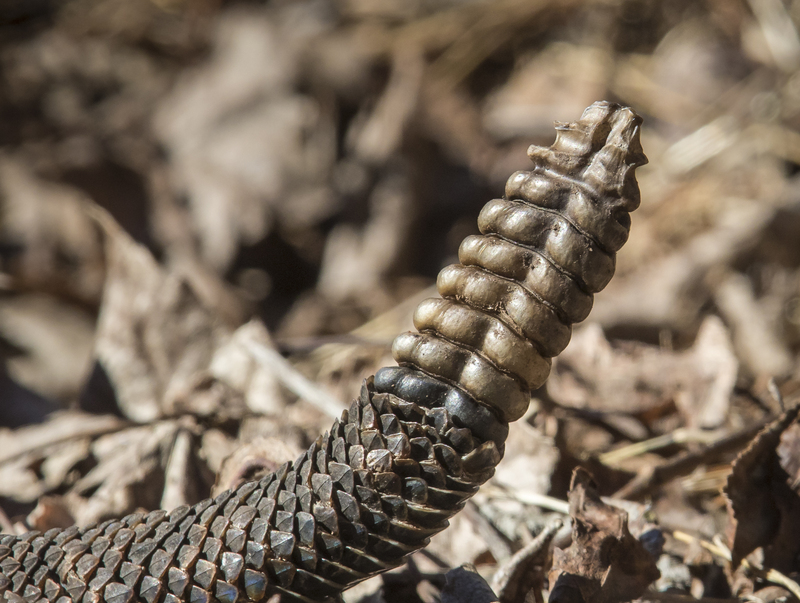 The more I looked, I thought maybe it was a Banded Water Snake, Nerodia fasciata, which can be rather dark on its dorsal surface, but can retain faint bands, like this one appeared to have. They usually have a diagnostic dark stripe from the eye to the back of the jaw line, and this one might have that, although it is hard to see. 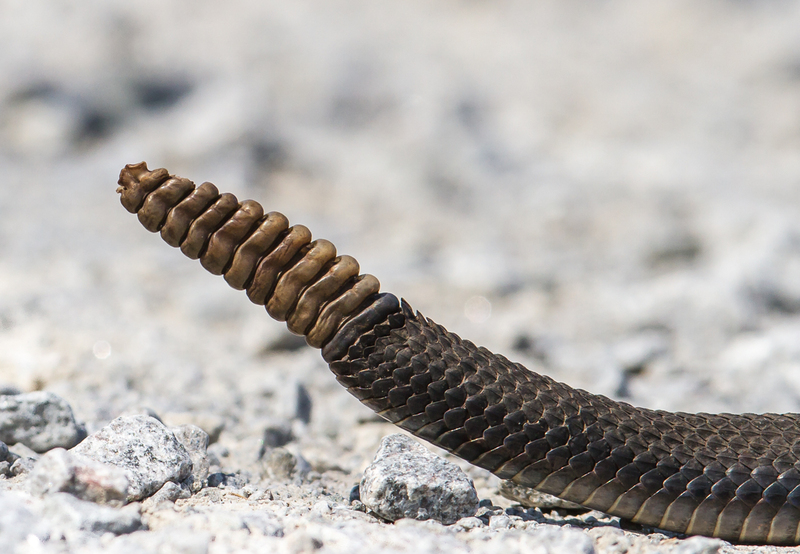 So, not quite sure, but snake species #2 for the day, nonetheless. 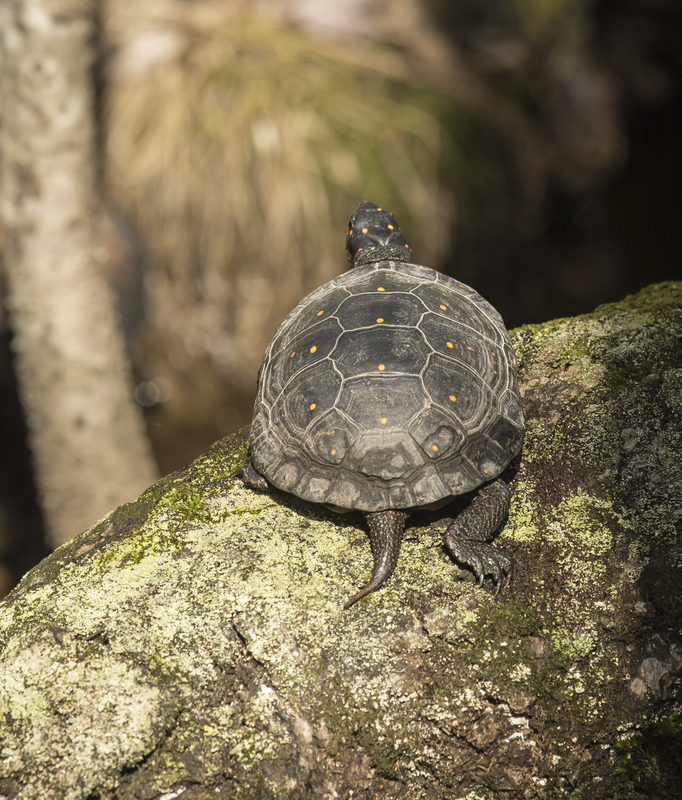 A few feet beyond the snake, someone glimpsed a Spotted Turtle, Clemmys guttata, basking on a log. 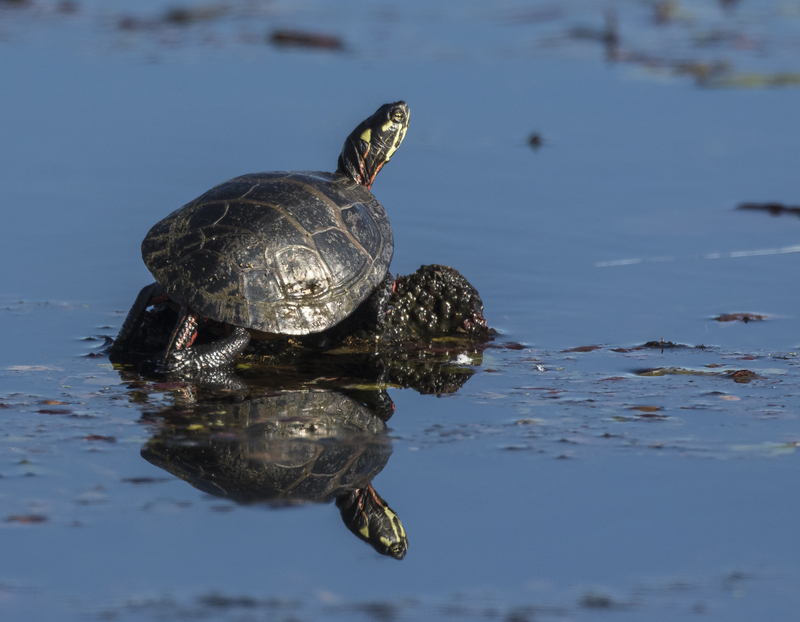 These beautiful turtles are more active in the spring, although it is not uncommon to see them on warm winter days. The wind started picking up and the temperature seemed to be dropping as we drove out of the park.Not far beyond the park entrance, I saw a car stopped in the oncoming lane, flashers on. The driver was out of the car and I noticed a large, orange-ish snake right in front of the stopped vehicle. 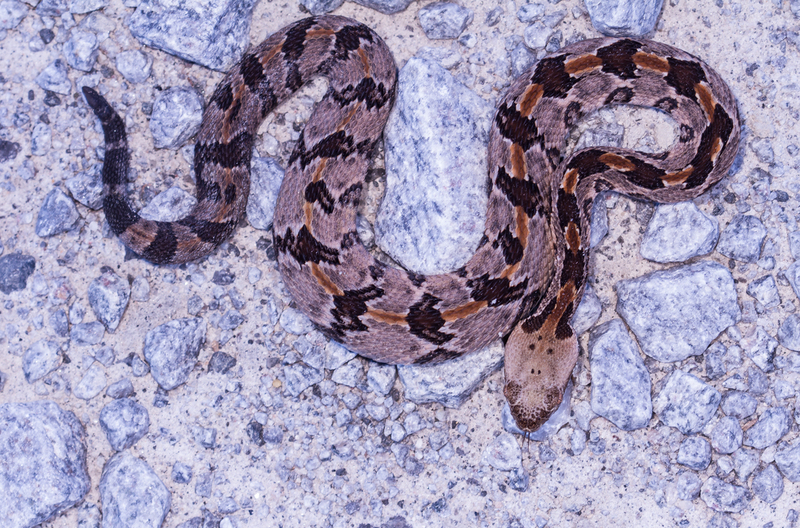 It was a Corn Snake, Elaphe guttata. 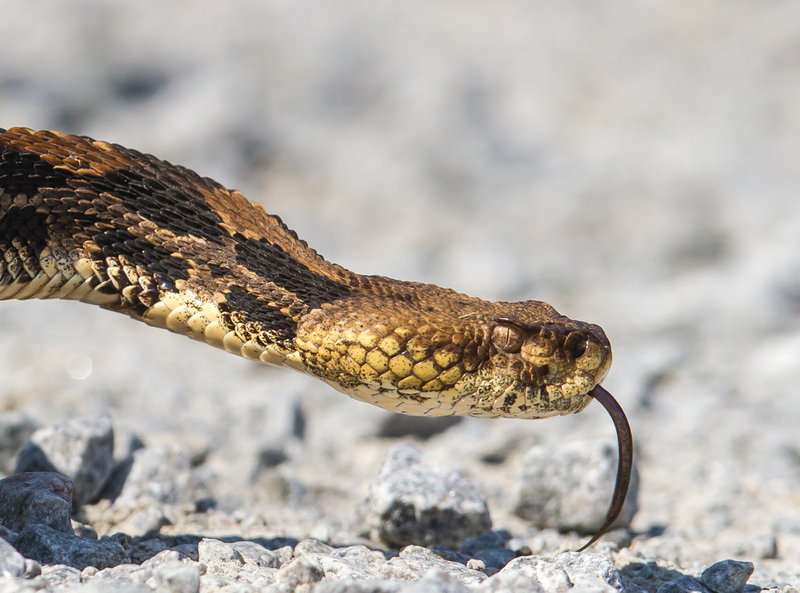 The driver picked up a flat piece of wood along the road and was undoubtedly headed back to shoo the snake out of harm’s way. A good deed, indeed. But for the Sheriff’s car behind us, I would have stopped for a closer look and a photo. Species #3! After everyone headed for home, I went back over to the Pungo Unit in hopes of getting some better photos of the rattlesnake, and seeing the Snow Geese in sunlight instead of gray skies like the previous couple of days. When I reached the tree with the hollow base, the snake was nowhere to be seen. That causes you to be extra cautious I might add….where did it go? 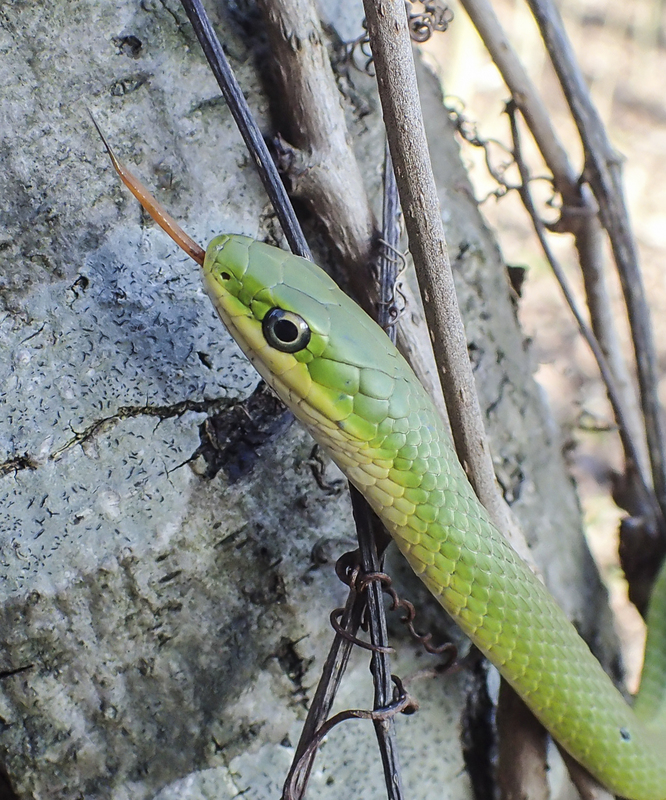 I walked a little farther, and saw a slight movement – snake species #4 for the day, a Rough Green Snake, Opheodrys aestivus. 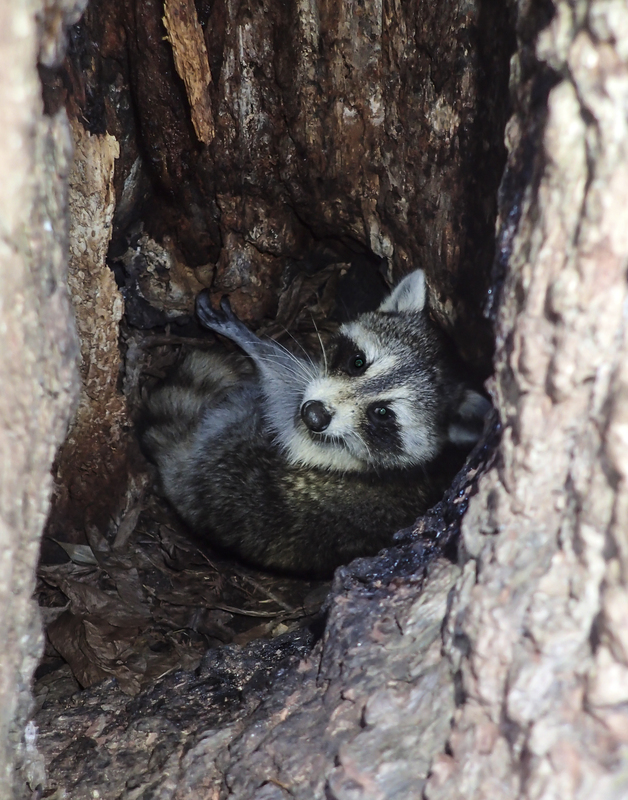 It was on the ground when I first saw it, but quickly moved to a tree trunk and began to climb. I soon walked on, carefully scanning the dried leaves ahead of me for signs of a snake, while still trying to look ahead for wildlife, such as bears, and overhead for eagles and other birds. It was, needless to say, a slow pace. I found myself shining my small flashlight (I always carry one) into every tree hollow and open base, looking for more snakes. One of the last trees I checked had a narrow opening just above the ground. When I leaned over and turned on my light, I was surprised (as was he) to see a sleepy Racoon roll over and look up at me. I guess I’ll be checking more hollow trees in the future. I’ll share more of what happened later that afternoon in another post (it was spectacular). First glance, nothing. But shining my light into the back of the recess, I saw the snake curled up, probably close to where Melissa had first seen it two days before. Amazing! I figured it would stay put since it was so cold, so I brought my group back several hours later. 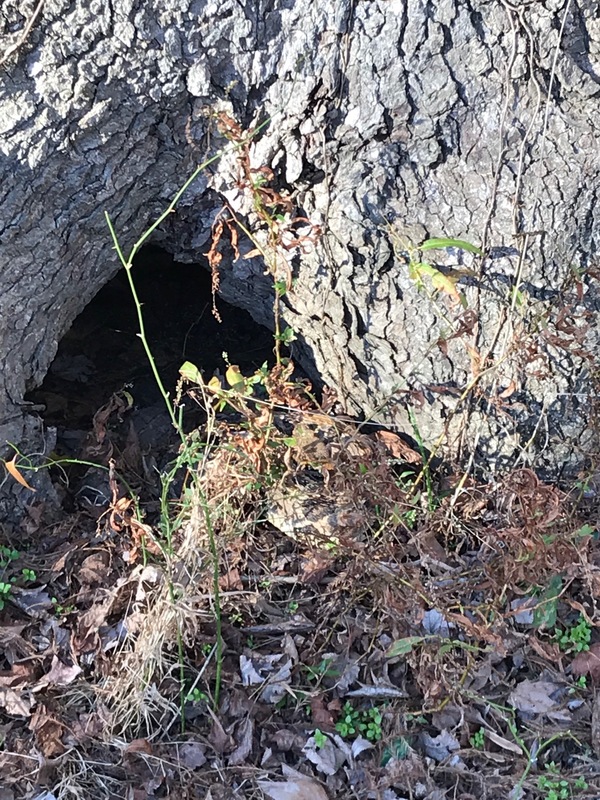 After having built up the fact that we would see an amazing winter surprise, I was, indeed, surprised when I looked back into the hollow – no snake. Lesson learned…you can’t get cocky when dealing with nature’s critters and their behavior. They are on their own schedule, and do things that constantly mystify and amaze me. Where had it gone? 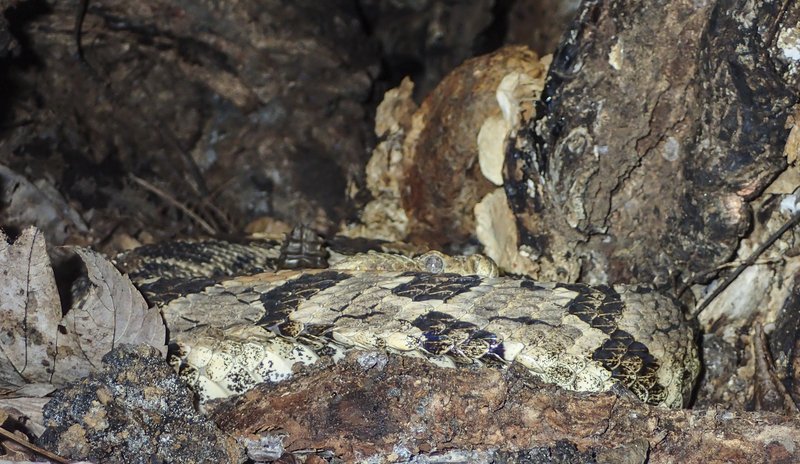 I thought I could see most of the area inside the hollow, but maybe there is a hole in there that the snake crawls into, which would be a much better insulator that lying up on the ground. Maybe that is where it had gone the afternoon before when I came back looking for it and couldn’t find it. But, whatever the case, the entire experience was incredible, and I am happy I could share at least parts of it with others. Pungo never disappoints.